Most simply, the idea of sustainability, or ecological design, is to ensure that our actions and decisions today do not inhibit the opportunities of future generations. This means making sure that our efforts work with our Earth’s ecological systems rather than in opposition to them. Given that all human actions alter the systems we live in, the challenge of sustainability is a complex issue. It includes looking at how we attain the resources we use, using them in a way to get the most from them, and eliminating the idea of ‘waste’ from our vocabulary. There is no way to know with certainty how complex ecological systems will react to our influence, but there is an undeniable responsibility to act with the best of our knowledge. 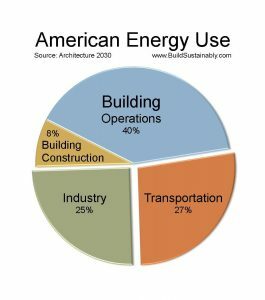 Buildings account for about 48 percent of the energy consumed in the United States, more than industry and transportation. Of this energy, heating and cooling systems use about 55 percent, while lights and appliances use the other 35 percent. Global Climate Change – the result of burning fossil fuels which increases greenhouse gasses in the upper atmosphere. Declining sources of non-renewable fuels – and increased damage from their extraction and use. Habitat Destruction & Loss of Bio-Diversity – conversion of wild lands to human developments combined with resource extraction. Toxic Pollution – the over-reliance on synthetic chemicals has many consequences that have complex interactions once released. Doerr Architecture is committed to the development of projects that minimize their impact on the natural environment. As part of that effort, we stay up to speed with the most effective strategies and technologies to produce more sustainable designs. And we work with owners to balance these opportunities with the myriad other factors that impact a building project. 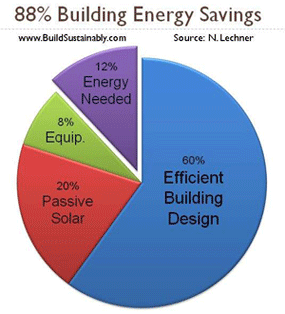 With today’s green technologies, we can design buildings that use 88% less energy. More than the remaining 12% can be supplied by renewable energy such as solar and wind. 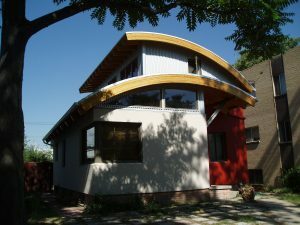 The net-zero energy Moore house already does this. The impacts of human development on other natural systems continue to grow and compound themselves. Since many of the best ideas of sustainable design also help reduce waste and costs to building owners and managers, it would be foolish not to use them. Every building project requires change to ecological systems and uses energy and resources; a perfectly green building is not truly possible. Instead, every building project presents the opportunity (some would argue, the responsibility) to improve its environmental performance, within the inevitable constraints of budget and building codes. Doerr Architecture welcomes this challenge. "After really listening to our needs, Thomas designed a beautiful sustainable home for us on time and in budget."